The Southern Nevada Water Authority (SNWA) has proposed to construct and operate the Clark, Lincoln, and White Pine Counties Groundwater Development (GWD) Project. The majority of the proposed GWD Project Area falls within the Great Basin and is underlain by a large, carbonate aquifer system containing many complex flow paths. Water from this aquifer, as well as local groundwater runoff from the mountains surrounding the valleys, feeds local and regional aquatic systems. 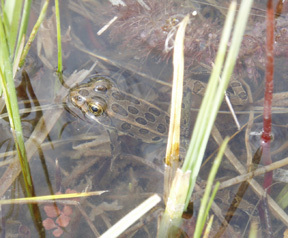 The aquatic systems in the Great Basin are largely isolated, giving rise to a number of unique and endemic species. Seven Federally threatened or endangered species, two Conservation Agreement species, and a host of Federal species of concern and State sensitive species are known to inhabit the aquatic systems in and adjacent to the GWD Project Area. 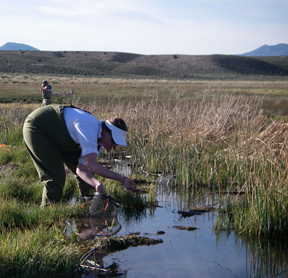 Therefore, to obtain baseline information on the aquatic communities in and around the proposed GWD Project Area, the SNWA contracted BIO-WEST, Inc. (BIO-WEST) to conduct ecological evaluations of aquatic systems in 11 valleys of east-central Nevada and west-central Utah (Biological Resources Study Area [BRSA]). The SNWA and BIO-WEST used a variety of criteria to select 101 aquatic systems of interest throughout the BRSA. Concurrently, we began a literature review and agency contact period to gather information about the aquatic systems of interest. We performed a reconnaissance trip to 40 aquatic systems in and adjacent to the BRSA and examined existing sampling methodologies, in order to develop a survey protocol for the aquatic systems of interest in the BRSA. We presented these protocols to a Technical Workgroup comprised of a variety of biologists and researchers from State and Federal resource agencies, as well as academia. Our goal from that meeting was to use lower-intensity surveys to inventory the aquatic communities at as many systems as possible throughout the BRSA. Location, water quality, and physical habitat data were collected at 105 locations within the aquatic systems of interest in the BRSA. In addition, the aquatic and riparian vegetation, fish, amphibian, and macroinvertebrate communities were qualitatively inventoried at 92 locations in the BRSA. Disturbance evaluations were completed at these same 92 locations, noting the factors causing disturbance and possible restoration options. We found that the aquatic systems of interest varied widely in their size, configuration, water quality, and habitat quality. Most survey sites were highly to moderately disturbed, with livestock-related damage, diversion, and nonnative species being the most common disturbance factors. Protection, restoration, and reintroduction/translocation alternatives are discussed, based on the disturbance level and species present at the aquatic systems of interest. We found Federal status or State sensitive species at aquatic systems in Tule Valley, Fish Springs Valley, Snake Valley, Spring Valley, Lake Valley, White River Valley, Cave Valley, Dry Lake Valley, and Pahranagat Valley. Our surveys expanded the range of the Toquerville springsnail (Pyrgulopsis kolobensis), the White River Valley springsnail (Pyrgulopsis sathos), and the Utah chub (Gila atraria). We may also have discovered a new species of springsnail in Tule Valley and a new amphipod species in the Pahranagat, Snake, and White River Valleys. 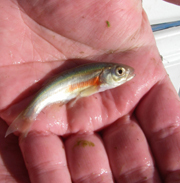 Fish surveys in Pahranagat Valley uncovered a population of the Pahranagat speckled dace that was thought to have been extirpated by the late 1990s. BIO-WEST is currently working with agency representatives to develop a long-term monitoring plan for Spring and Southern Snake Valleys in an effort to preserve the aquatic resources in those unique locations.